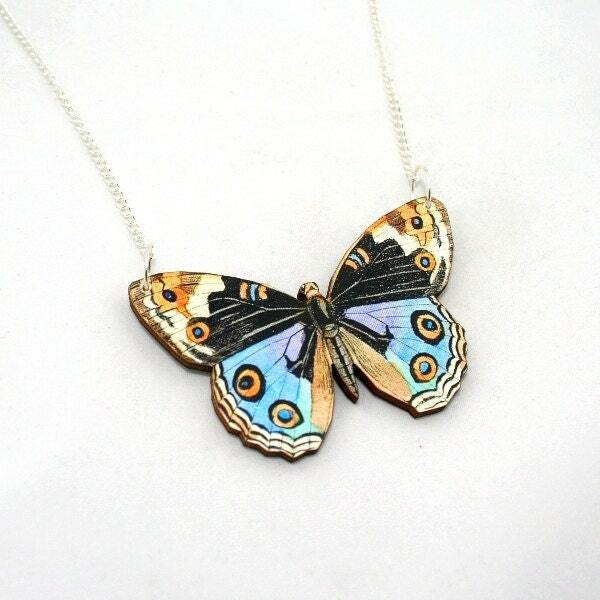 Blue Decorative Wooden Butterfly Illustration Pendant Necklace. This beautiful butterfly necklace has been made by adhering a pale blue decorative butterfly image to 1/8” (3-4mm) thick wood board and then laser cutting to shape. The reverse of the butterfly pendant has been painted black. The pendant has then been added to an 18” (45cm) silver plated split chain. Purchases made after these dates may not arrive in time for Christmas, please place orders in plenty of time to avoid disappointment. Thank you, the necklace is lovely and the delivery was very quick. That was a really fast shipping. Nice necklace, my daughter will love it. Thank you.